200m2 Exhibitions is delighted to announce that it will be one of the key exhibitors at the upcoming Devon Business Show. 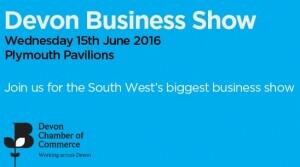 Organised by the Devon Chamber of Commerce, the Plymouth based Business Show is the South West’s premier business even. This year’s show will be held at the Plymouth Pavillions venue on Wednesday 15 June 2016. Building on from the last year’s show, the 2016 event aims to provide a high-profile forum for businesses to showcase the products and services they have to offer. Firms will also be able to access information and expert advice whilst networking with potential customers and suppliers. As one of the South West’s leading exhibition stand companies, 200m2 will be showcasing its latest range of modular exhibition solutions on Stand 46. In support of the Devon Chamber of Commerce, 200m2 will be offering a 20% discount on all orders taken at the show.